(1) Have you ever tried to have a four, two, and one year old maintain a quiet voice for a long period of time? Enough said. (2) Daniel destroys libraries. He literally just puts a hand out and shoves as many books, CDs, DVDs, etc. off of the shelves. While you’re trying to clean up his first mess, he is screeching and off ruining another part of the library and/or has run out the exit. The librarians force a smile but they really want to kill you. (3) Months and months ago, Tim made the mistake of letting Isabelle play a game on the computer when he took her to the library. Ever since, every time she complains how I won’t let her play. Tim has never been back to the library since. (4) We always end up (abruptly) leaving with about twenty books since I feel the need to get every book they want because each time I leave I say to myself, “I am never coming back here again.” We then get home and the worst part is they want me to actually READ to them. Now one or two books are okay but you know they want all twenty. (5) The library books disappear. I try to keep track of them, we have special places for books in each room, but inevitably when they are due back there is always one that eludes me. Luckily, the late fee is miniscule but it drives me crazy that I can’t find them. On that topic, if anyone sees a “How Do Dinosaurs Say Goodnight?” lying around my house, please let me know. It’s currently overdue and MIA. Around the holiday season I often find the need to remind myself of a few things that I thought I’d share. 1. Remember the Magic: Kids are only young once so take a minute to talk to your kids about Rudolph, decorate the house with cheesy holiday decorations, drive around just to look at Christmas lights, and bake cookies for Santa. You’ll be glad you did. 2. Remember what most people want: One of the best presents you can give to someone else is your time. 3. Remember traditions: No matter how little or silly it seems if you remember doing something with your family around the holidays then keep it up with your kids. Can’t think of anything? Well then start a new tradition. 4. Remember to say thank you: Say it, write it, type it, Skype it – Just do it. 5. Remember to be nice: Be nice to the cashier in line that you waited forever to get to, be nice to the mailman whose been working extra hard stuffing your mailbox with holiday cards, be nice to people putting on free events for crabby kids this season. Just be nice. 6. Remember we don’t live in a Martha Stewart Magazine: Beautiful Christmas bulbs, glass angels, Pinecone rosette garland? Umm…not possible here. My house is full of shatterproof ornaments, decorations can only be hung higher than the one year old can reach, and there are more homemade crafts hanging around than can be counted. This is our life now and I’m going to enjoy every minute of it. 7. Remember to relax and enjoy: Stay up late talking with family you don’t see often, have an extra dessert (or five), let the kids wear what they want on Xmas Day without a fight, take lots of pictures, and take a deep breath and relaxxxxxxxxxxxxxx. You deserve it! Two of my sister in laws and I had the pleasure of taking our girls to see the Nutcracker this past weekend. As our girls get older, it’s exciting for us to bring them new places and let them have some special “girl time.” We all live hours apart from each other and we each have three children so it’s nice to be able to spend some one on one time with just the “big” girls. We were also able to score some cheap tickets to a one hour performance outside of New York City so it was perfect for us. The show was great and the girls had a blast. Of course, they are still little so there were lots of questions, lots of squirming, and lots of discussion about after the show snacks. Also, it turns out that not only have I never seen the Nutcracker before but apparently I knew NOTHING about the story at all. Luckily, I was able to eavesdrop on some answers that Peggy was giving Natalie during the show to find out some tidbits. Something I didn’t find out until after the show was over though was a shocker – that guy was supposed to be the Nutcracker come to life? Wow, who knew?! Perhaps, I should locate the Barbie Nutcracker that my nieces were telling me about. Yup, I got schooled on the Nutcracker by a three and five year old. Clearly, I’m going to have to read up before next year’s performance! 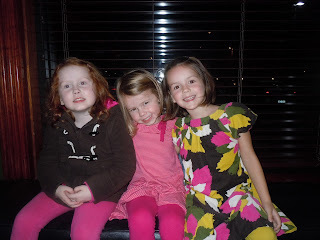 Waiting for a table for dinner after a fabulous girls day out! How many is too many for a sleepover? Is Daniel ready for Kindergarten?